JUMLA, Aug 17: It has been almost a week since the government of Karnali Province formed a taskforce to investigate into police brutality against supporters of Dr Govinda KC at Karnali Academy of Health Sciences (KAHS). However, much to the disappointment of Jumla locals, the taskforce has yet to begin its investigation. The meeting of Karnali’s provincial cabinet last Saturday had given the taskforce a week for investigation. 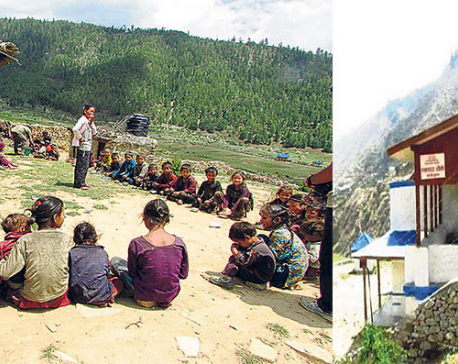 With just two days remaining for the deadline, the taskforce has yet to visit Jumla. Karnali locals meanwhile said the dillydallying shows that the government has no intention to punish those guilty. Kalanidhi Paudel, coordinator of the taskforce, said they have yet to receive a letter of approval to begin the investigation. “Although the council formed the team, we have not received an approval letter. We’ll travel to the incident site Jumla as soon as we get the letter,” he said. Karnali Province’s Heath Division Chief Birsha Bahadur Shahi, who is also a member of the taskforce, is currently in Kathmandu on some official business. He said that their investigation might take longer due to delay in starting the work. “I plan to reach Jumla by Saturday and start our work immediately,” said Shahi. The incident had happened at KAHS premises when security personnel made attempts to dislodge the fasting Dr KC from KAHS to bring him to Kathmandu. Police brutally beat up students, doctors, nurses and locals in the process. “The probe committee set up by the KAHS has not done its job. Now the taskforce formed by the provincial government is also negligent,” said Raj Bahadur Mahat, chairman of civil society in Jumla. “Use of brutal force on the hospital premises is completely unacceptable. Those guilty should not be spared,” he added.